First of all, God bless air conditioners everywhere-they just keep on doing their jobs, keeping people like me who can't seem to tolerate the heat anymore nice and cool so we can knit! 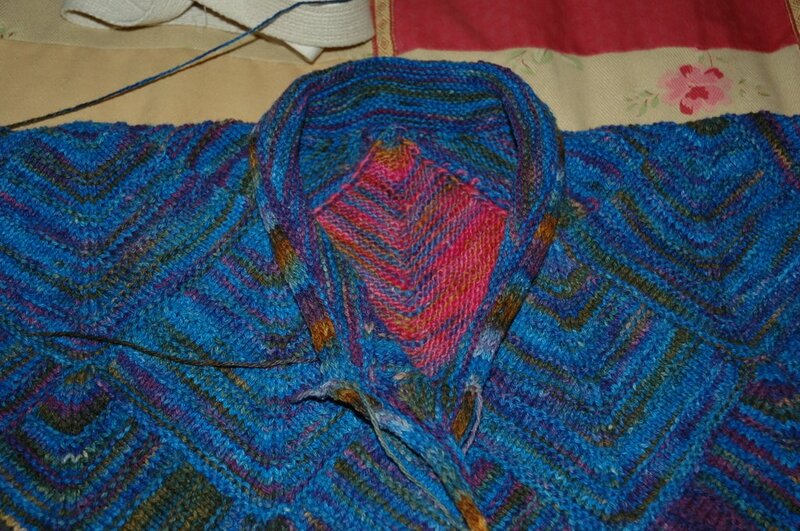 The mostly blue modular sweater is coming along-I took the pinky Ottawa off the collar, made a more dignified narrow shawl collar for it, then edged the fronts on 3 stitch I-cord edging for the button bands, and 5 stitch I-cord edging for the collar. 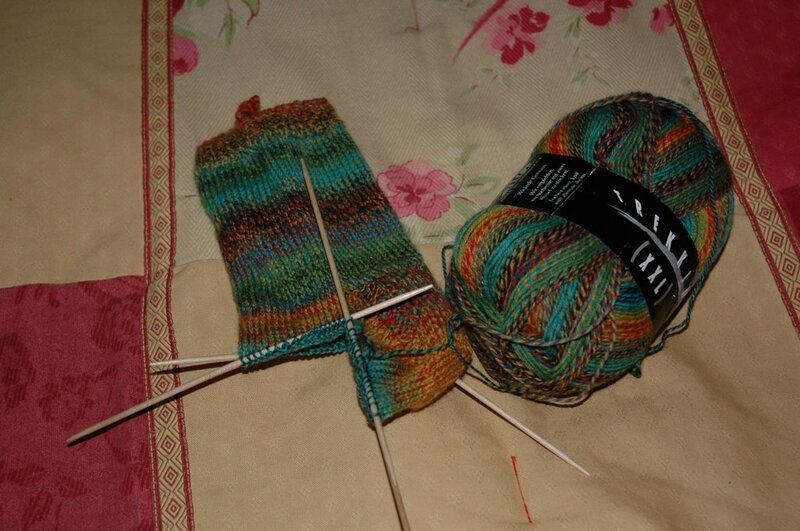 The new skein of Silk Stream I got was not, in fact, in the Mermaid colourway, but in the Woodland colourway. The colours are identical-the proportions are not. So I am using it for edgings and for sleeves. I think it will work. 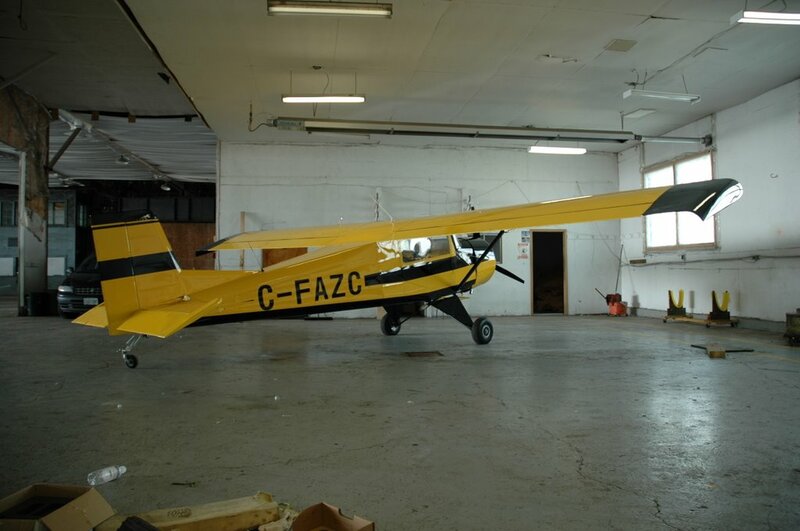 And this is the airplane my husband built with his classes, and in which he will (hopefully) be flying to Oshkosh, Wisconsin , for a huge home built airplane show. (the show is huge-not necessarily the airplanes) This weekend. To get there for next week. It's really yellow, don't you think? My husband was a pilot in the Canadian Air Force for many, many years. He has never had a desire to own his own plane - thank heaven. Love your sweater. I used Silk Stream in the Clapotis I posted on my blog today. 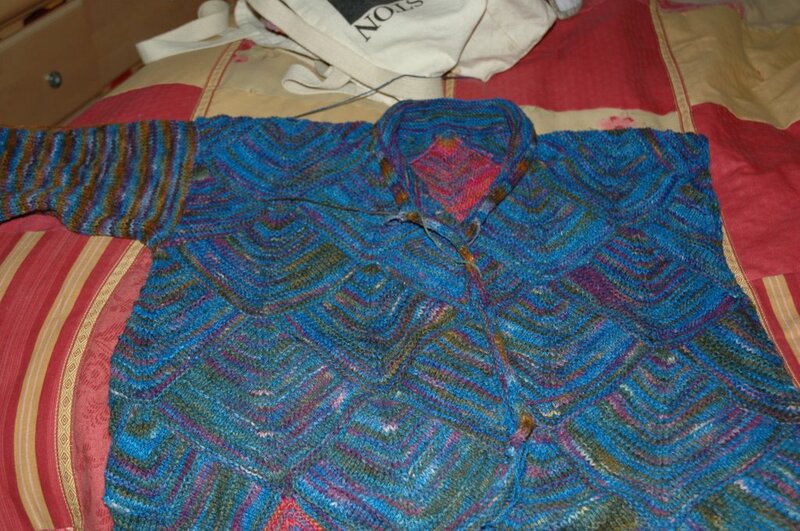 I would like to knit a plain coloured sweater with Silk Stream! Gorgeous sweater, the colours are lovely. Nice anniversary story - 15 years ago I spent my honeymoon watching my husband help a friend change an engine in his car:) and we survived! Thanks for all the nice comments on my sweater-I have ripped and knit and reknit-but I am happy with it now. Yes, Ruby-the plane DOES fly-so he'll be flying around the house, over and over again, trying to build up the required 25 hours. Gill-loved your story about the engine change-I guess our marriage will survive, too!!!! Cute airplane. Your husband owes you through eternity! !